This summer, before going off to college, the BSTS interns had the opportunity to train with black belt instructors at Kicks Karate in Potomac (http://kickskarate.com). Dr. Rich feels strongly that young women and men need to understand basic self-defense strategies to avoid situations in which they may be harmed. 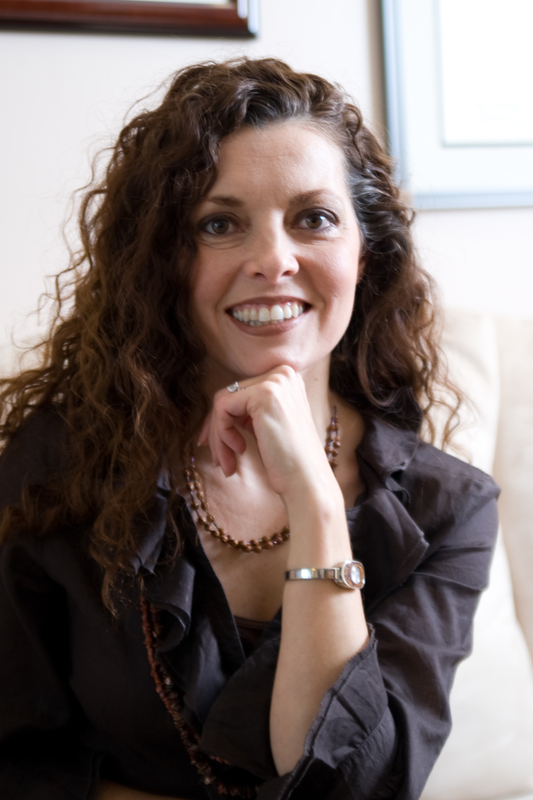 With the epidemic of binge drinking on college campuses, she encourages all of her patients to be trained in self-defense before leaving high school. In this BSTS session, Black Belt Master Chris and Lead Instructor Master Nick shared insights on how to be safe and make smart decisions when going out socially and taught the interns several key self-defense body moves for getting out of unavoidable danger. Watch the video on our YouTube channel and learn those key self-defense body moves alongside us. Alcohol and other drugs impairs our mental ability to make safe choices. Substances influence our judgment, making unsafe people or situations seem okay. Usually we don’t expect anything “bad” happening since we live in an area protected by the law. Don’t wait to second guess an assailant’s motives à Act fast! If you are uneasy or comfortable with something say “NO!” loudly in a very clear voice with a different tone (high or low pitch) and intensity. despite the feeling of “group okay,” have the strength to step out and to intervene (unfortunately people tend to watch and become numb if they witness something wrong happening). Self-defense is nasty, but it’s to protect you from becoming a victim! We hope this video encourages you to take a self-defense class, and most importantly to have the moral courage to stop something wrong from happening to yourself or someone else. We thank Masters Chris and Nick with Kicks Karate for talking to us about the importance of self-defense, for raising our awareness about dangerous situations, and for teaching us some basic strategies. Our Better Safe than Sorry Project effort with Planned Parenthood of Metropolitan Washington in recognition of FASD Awareness Day was a success. Six volunteers distributed condoms at a booth outside The Barking Dog bar in Bethesda, Maryland on Saturday evening (before the party crowd). Our aim was to test the idea as a pilot project, to gather reactions from pedestrians and patrons, and to learn more for future campaign events. Our display booth with free condoms was visited by a number of pedestrians and bar patrons. Informational condom cards made a nice display with the U.S. Surgeon General’s warning cards by the bathroom door. 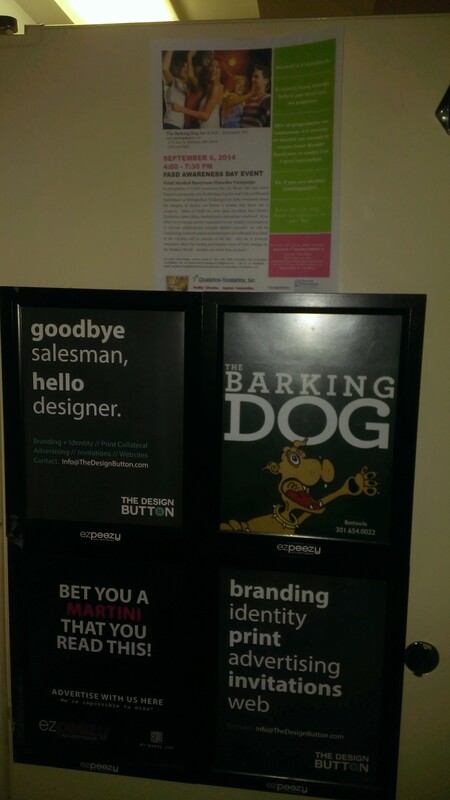 We posted posters behind the bathroom stalls where customers could read over the information in privacy. Female bartenders felt passing a condom with the first drink of the evening would seem like a proposition. Duh! Why didn’t we think of that??? 50 and 60-somethings agreed to share the informational condom pocket cards with their 20 and 30-somethings (who were partying elsewhere) – men seemed more open than women. A scientist from the Environmental Protection Agency now knows that prenatal alcohol exposure affects 2-6% of American children – a bigger problem than environmental chemicals! Most people thought that the CDC rate of 1 in 8 (13%) underestimated true numbers of college women binge drinking and were shocked that 50% of U.S. pregnancies are unplanned. When passing a condom to a pedestrian, do so discretely (i.e., whisper, don’t shout – “Use a condom if you drink alcohol!”). 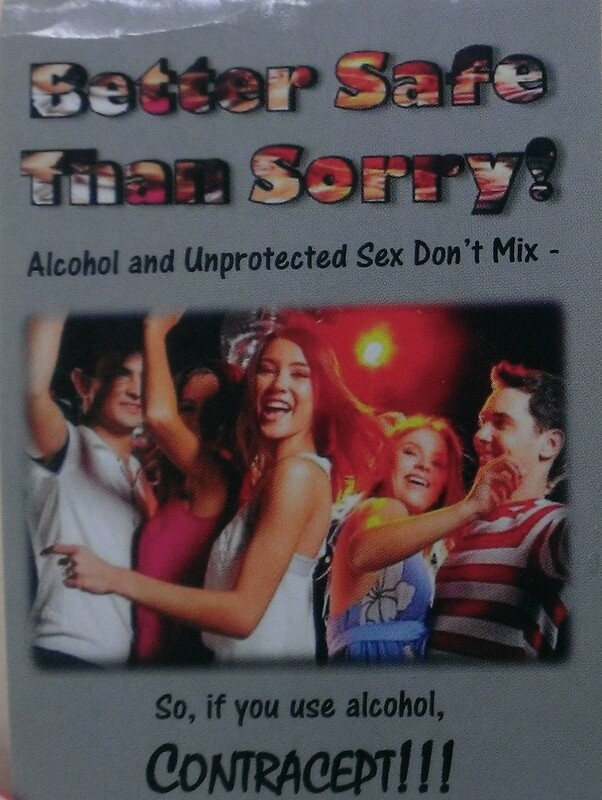 Pass it on – Contracept if you drink alcohol to prevent FASD!!!! 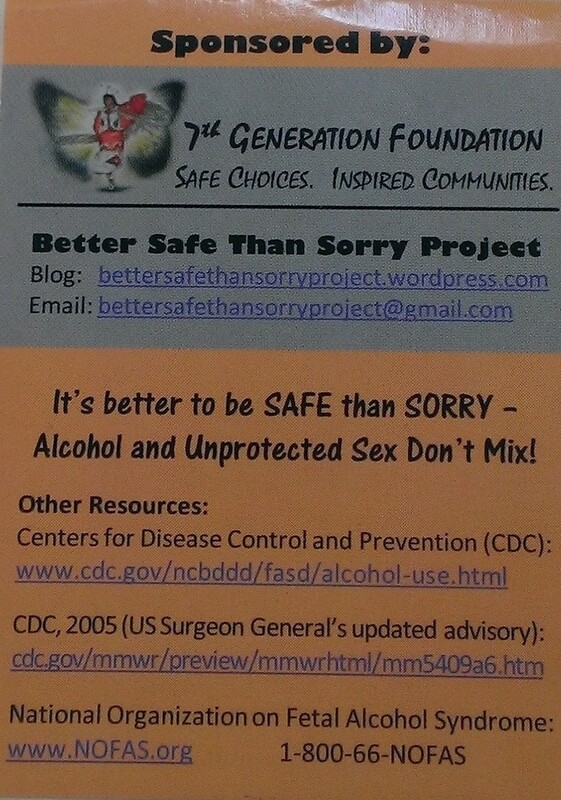 In recognition of FASD Awareness Day, on September 6th, the Better Safe than Sorry Project Team will be at the Barking Dog pub in Bethesda, MD distributing 999 condoms and informational materials about FASD. The condoms were donated by the Planned Parenthood of Metropolitan Washington. For each first drink of the evening purchased, patrons of the bar will receive a condom with a bookmark cover to promote contraception for alcohol consumers. BSTS project volunteers will provide information and a brief discussion about FASD for those who express interest in learning more. Our project concept was developed by our interns after the idea was suggested during one of our summer talk show segments. From a primary prevention perspective, It’s a little further “upstream” approach than the pregnancy test kits in bars – another extraordinarily innovative project implemented in Minnesota and Alaska.